At the Wellesley College Alumnae Association’s 91st annual Alumnae Leadership Council on Saturday, October 18, four exceptional alumnae volunteers were presented with the Sed Ministrare Volunteer Award. The award, which is new this year, was established to honor and celebrate outstanding volunteer service to Wellesley College. “We have thousands of alumnae who give generously of their time and talents for Wellesley. The board of directors and I are thrilled to have an opportunity to recognize those whose service goes above and beyond,” says Karen E. Williamson ’69, president of the Wellesley College Alumnae Association. This year’s recipients are Whitney Shaffer Ackerman ’03, Martha Reardon Bewick ’62, Charlotte Hayes ’75, and Helen Kriz Marshall ’77. Past president of the New York Wellesley Club and one of the Alumnae Association’s youngest leaders of a major club when she first came to office, Whitney Shaffer Ackerman embraced her role of club leader by engaging and motivating volunteers and by setting short- and long-term goals. She not only was a strong leader but also a great team player, caring listener, and someone who saw solutions and implemented an action plan. Whitney was honored for her exemplary leadership. From a student leader to an alumna leader, Martha Reardon Bewick has served as a devoted volunteer and class leader for more than 50 years. She never stops reaching out to classmates and continually infuses the class with the Wellesley spirit by always promoting an eagerness to participate and a willingness to give back to Wellesley. Martha was honored for this lifetime spirit and for her commitment to her class. Charlotte Hayes is one of the many “unsung-heroes” who serve our classes, clubs, and the College. She was recognized for her outstanding dedication and service to the Wellesley in Washington Internship Program and Washington Wintersession. Her volunteer work engages alumse to serve as mentors for our students while also connecting them to the club and to the College. Her extensive connections in the D.C. area are invaluable to the College and our students. Charlotte was honored for her service to the College and for the example she sets in strengthening the Wellesley Alumnae Network. 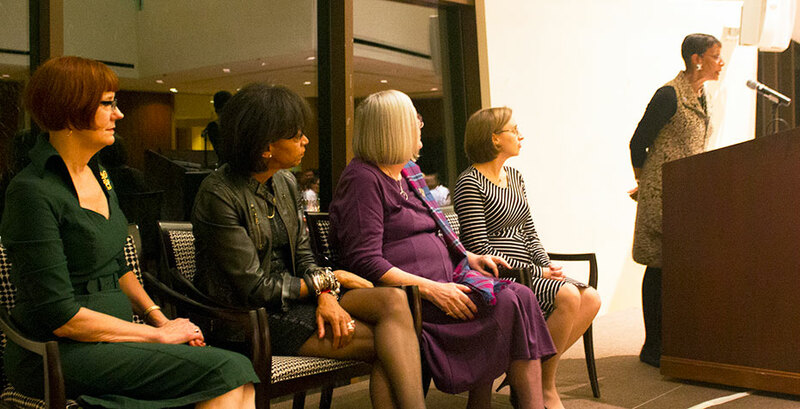 The former president of the Chicago Wellesley Club and current class president, Helen Kriz Marshall is well known for her energy, enthusiasm, creativity, and personal touch, going the “extra-mile” to engage alumnae and motivating them to be more involved. She has a love for “all things Wellesley” and eagerly incorporates our traditions into events. Helen was honored for her True Blue Wellesley spirit and for her dedicated leadership. You can learn more about the Sed Ministrare Volunteer Award criteria, and how to nominate an alum, by visiting the Wellesley College Alumnae Association website.